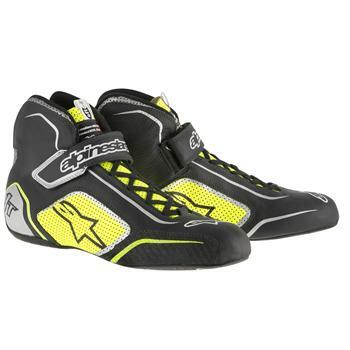 Alpinestars Racing Shoes - Tech 1-T UNIVERSAL - Brakeswap.com - Friction for the Win! Incorporating premium materials – inside and out – the Tech 1-T is an extremely lightweight, abrasion-resistant shoe that offers superb comfort features and performance. It incorporates a weight-saving, rubber-compound textured sole for outstanding grip, heel-to-toe feel and vibration resistance. Dual closure system incorporates adjustable Velcro strap plus lace loop system for durability, personalized fit and secure closure. Nomex tubular lining construction for excellent heat-resistance, weight-saving and reduced seams.